OWERRI—FOLLOWING the inability of the Imo State Gov-ernment to defray its over N200 million indebtedness to the Enugu Electricity Distribution Company (EEDC), the electricity power provider has disconnected all power supplies to the Imo State Government House and the state secretariat. Angered by the disconnection, the state government has commenced moves to demolish the EEDC office in Owerri, the Imo State capital. The spokesman of the EEDC, Mr. Emeka Ezeh, confirmed the disconnection, while adding that it was not the intention of the company to make the disconnection a media issue, as efforts were still being made to get the state government to do the needful. He however, regretted that EEDC is already aware that their office in Owerri had been marked by the state government for demolition. He said: “We suffer all manner of bashing from the public once our services falter. Now, how can we optimally render qualitative service when key stakeholders who use our services refuse to pay? “The state also takes care of the bills of the Imo State Oil Producing Area Development Commission, ISOPADEC, communities and for a long time now, those communities in Oguta and Ohaji Egbema have also been disconnected because their bills have not been settled. One of the indigenes of Ejemekwuru in Oguta, Benson Obiefule,said that the community had not had power supply in the last five years due to indebtedness to EEDC and the inability of ISOPADEC to pay their bills as agreed. Reacting to the development, Mr. Mark Uchendu, the Commissioner for Public Utilities said he was aware of the power issues with the EEDC, but maintained that the core problem was one of reconciliation. “The figures are exaggerated. I am sorting out the documents and what we need to do is to sit down with EEDC and reconcile the actual indebtedness of the government,” he said. When Vanguard visited Imo Government House yesterday, a source said it has been powered by generator for two days now. “I am aware that sometime last year, the governor (Rochas Okorocha) paid EEDC about N200 million for power supply, so all we need to do now is reconcile and agree on whether we need to balance the EEDC any outstanding or not. 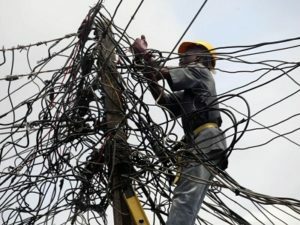 “On the disconnection of government facilities and offices, Uchendu said that power supply in Government House is no longer their major concern, but noted that the festering blackout in the state secretariat was a major concern to the state. “The disconnection of the state secretariat is a major issue for us. We need to also reconcile that because the bill of over N45 million EEDC brought for the secretariat appears rather inflated to us because prepaid meters are used there,” the commissioner said. Uchendu regretted that the ISOPADEC communities in Oguta and Ohaji Egbema were also in darkness due to indebtedness to EEDC, but added that it was the responsibility of ISOPADEC to defray the debt from their 13 per cent derivation. “It is not the direct responsibility of government to pay the electricity bills of Oguta and Ohaji Egbema. The commission does that,” he said.